Well said sister. So, I am taking to the roof to conquer my fears. In an act of solidarity with other women who follow Eleanor’s advice, on most days at least, I decided that my fear of heights (despite my high school days as a cheerleader teetering at the top of pyramids & being tossed into the air like an apple), had to come down. So in order to diminish my literal fear of swinging in trees, and to lower my anxiety which would proverbially keep me “out of the tree tops”, I decided I would paint (just a section, mind you) of my home’s third story. 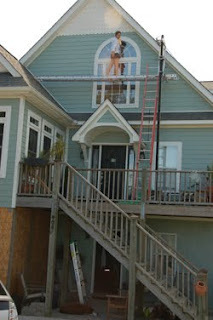 When the contractor finished construction on the house, he kindly left the scaffolding up so we could save a dollar and paint the house ourselves. My husband and I literally took to the skies, where the smallest breeze had me grasping for anything to hold on to and feeling as if I could be lifted off the scaffolding. However scared I was, I stayed and painted. And, I survived and came down to tell the story. After several trips up and down the ladder, and scooting, sliding, and somewhat walking on the scaffolding in order to finish painting, I learned something. My fear DID INCREASE when I climbed up the ladder. But repeating this action did DECREASE my overall fear. In the end analysis, after two days of “roof swinging”, I learned Mrs. Roosevelt was indeed right. Doing something you fear everyday does decrease your overall chances of being fearful in the future. Ah – the sweet smell of courage. If we can all stand atop that roof confidently (& breathing! ), then we can all better handle Future Fear. So, the next time Fear rears its ugly head, I’ll be better equipped. Will you? *Photos: Evidence of Overcoming my Fear of heights(and heights + wind gusts), at least for a weekend.